San Francisco, CA - April 5th , 2014 NAB Show - Fiilex, a leader in LED lighting for the broadcast, film and photo industries, announces the release of their latest lighting kit, the K302. The kit is comprised of three P360EX Lights w/ Barndoors, three AC/DC Power Adapters, three Reverse Leg Light Stands, a 15" x 15" Softbox, a Speedring, and a Rolling Travel Case. The P360EX is lightweight, color tunable (3000-5600K), and offers enhanced protection from water. It has an IP-24 rating, allowing it to be used in the rain and high humidity settings without a problem. The light also offers DMX controllability with the optional DMX Connection Box. The light is also 20% brighter than the previous model, and still maintains a high CRI >92. 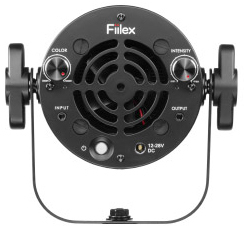 "Fiilex is dedicated to providing lighting solutions for image makers and broadcasters. Professionals always want brighter lights, so we are constantly working on that, but what good is a brighter light if it can't work in varied environments? With the enhanced weather protection on the P360EX, we now offer a brighter light, that can go more places," says Brent Siebenaler Brand Manager for Fiilex, " We added DMX Control as well, so light adjustments can be made centrally, a feature our users requested. The K302 Kit is the ideal solution for those who need power and control in environments they can not control." The added features of the P360EX are: a 400W equivalent output (90w Draw), runs on AC power or standard broadcast batteries, cool to the touch housing, and a magnetic accessory mount. Available accessories include a Dome Diffuser, Fresnel Lens, Gel Holder, Umbrella Holder, Rain Shield, D-Tap Cable and DMX Connection Box. The K302 Kit is available now from dealers throughout the U.S., Canada, and Europe. The U.S. retail price is $2,849.00 The optional DMX Connection Box is $150.00. For a complete list of dealers and accessories please go to www.fiilex.com.